This bayonet was designed to not only be a bayonet but also act as a flash hider. The two upper tines along with the actual blade of the bayonet function as a "3 Prong" flash hider. This original bayonet is in good condition and has been factory refinished by DS Arms. The bayonet includes the scabbard. 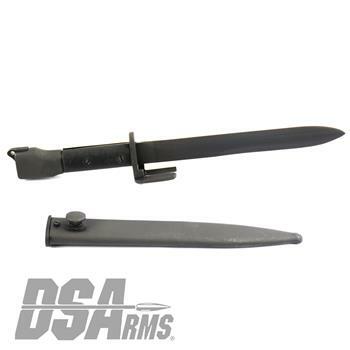 This bayonet is designed to only fit the Israeli light barrel FAL that has the bayonet lug. This will not install on a barrel that has been outfitted with a flash hider. Note: This bayonet will NOT fit G1 lugged barrels.